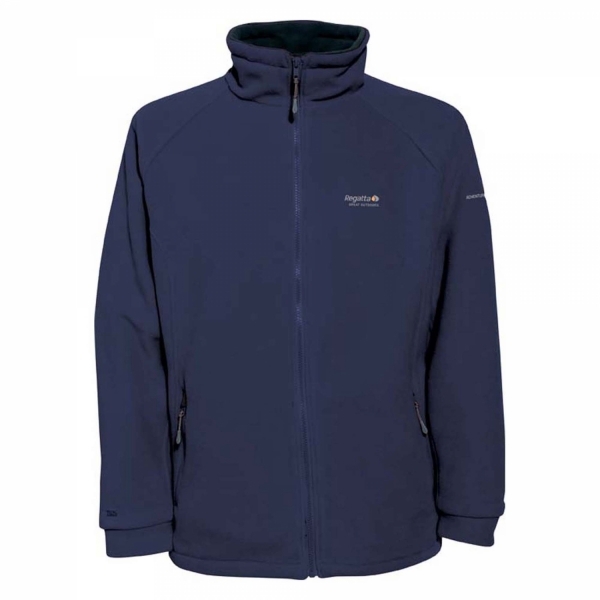 Having been converted to the benefits of fleeces, I have another one here – the Regatta Tectonic 2 – which does give you the impression of something ground-breaking. I’m not sure it’s that quite the case, but it’s certainly a good mug’s eye-full. Firstly, this isn’t a standard “jumper style” fleece – it’s actually a fleece/jacket – which makes this a good choice for getting outdoors. To see how waterproof a fabric is, a column of water is pressed against it. The amount of water in the column is increased until the water penetrates the fabric. This amount is measured in millimetres and is called the hydrostatic head – so the higher the number, the more waterproof the fabric is. We work on the rough scale that 3000mm is decent waterproofing on a jacket, so the Tectonic 2’s 5000mm will be good news whilst out walking. In addition, the outer finish has a water-resistant coating. I’ve been testing the jacket in various weather conditions, and it is quite water-resistant – most light showers will be no problem for the Tectonic 2. Will an OS map go all the way in? Yes - and it zips up too! Yes, standard size OS maps fit in the inside pocket no problem – some thought has been given there. What’s the fit like? Well, I liked it – it’s comfortable and cosy and it doesn’t feel too bulk either. The only down side – and it isn’t just a problem with this jacket – is the type of material on the outer layer traps dog hairs like wasps and jam! They can be removed with one of those special brushes or by simply picking them off, but it’s something to be aware of if you’re a dog owner. Dog hairs trapped in the fabric - although they do come out with a brush. That said, the Regatta Tectonic 2 is a great jacket and at full price – near on £60 – it would have got an 8. But, the jacket has recently moved into the Regatta Outlet – their online clearance store – so it’s available with some cracking discount. For example, the small in Navy is £30 and the large in Red is an amazing £18! At those prices, the Tectonic 2 is a fantastic buy. To buy the Tectonic 2 from the Regatta Outlet, click here for the direct link. Fleece fabric is very durable. The material is primarily soft and insulating. It is warm, comfortable, and highly breathable.